Four years after the IDE64 V3.4 release, IDE64 Project staff comes with the new IDE64 device. IDE64 V4.1 is the long awaited successor of the IDE64 V3.4 build using the present-day technology. 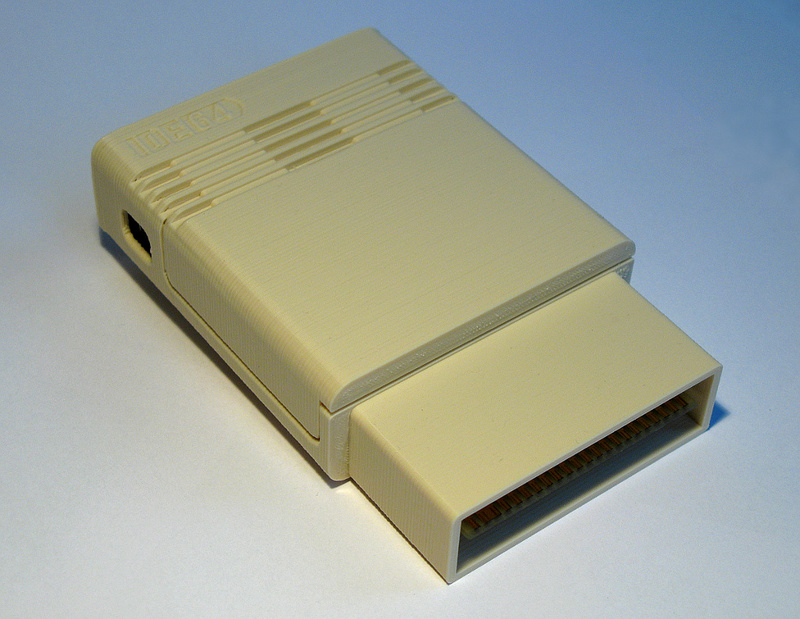 The new IDE64 can be used with the variety of up-to-date or archaic devices witch makes IDE64 V4.1 the most versatile peripheral device for Commodore 64. It supports CompactFlash (CF), DVD-ROMs, Hard Disks, CD-ROMs, ZiP drive, LS-120 and more. Contrary to the successor IDE64 can serve three devices in the same time. When used with CF, IDE64 doesn't need any additional power supply, CF has low power consumption (including IDE64 approx. 140mA). Of course the IDE64 can be used with CF, standard ATA hard disk drives or DVD/CD-ROMs together. 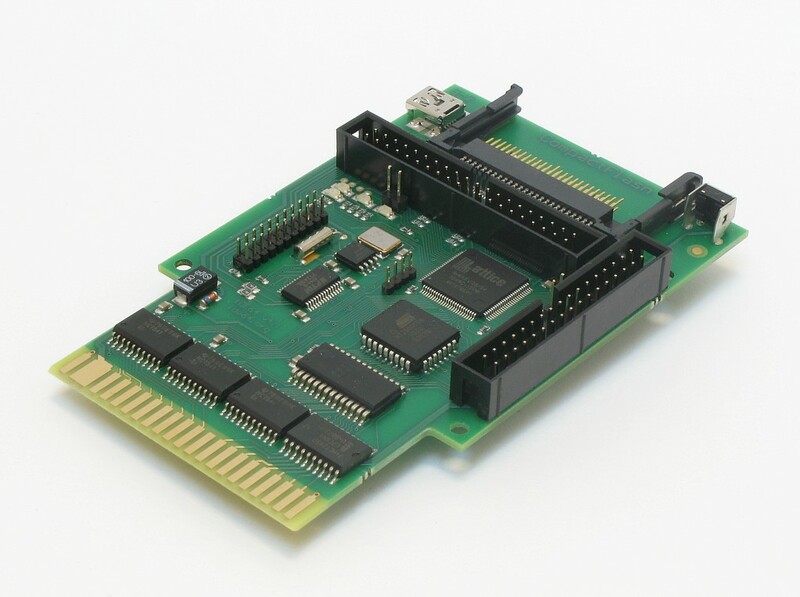 First IDE64 controller V1.1 was publicly available in December 1997, but the development go down to 1994 when the first experiments began. Until now there were four major updates. 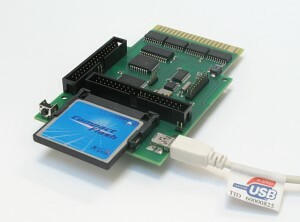 Together with the hardware, operating system and utilities contained in the cards 'firmware' are continually developed. Time after time the firmware updates are released freely and users are able to update the card and take benefits of new features and bug fixes. Beside the IDE64 native and DOS file system support it contain freezer capable Machine Code Monitor and stunning File Manager. 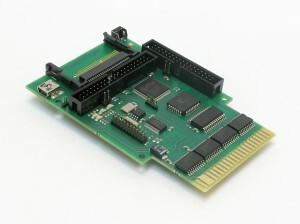 The current IDE64-DOS V.90 is very matured, completely reworked from scratch and offers many new features including support of partitions, relative files, large capacity media and together with the redesigned IDE64 architecture offers incredible speed which for example enables users to stream hi-resolution video at the 25 fps! See 'Rush' created by Singular Crew for Console/Real Wild compo at Breakpoint 2008. The IDE64 is compatible with alternative operating systems GEOS and WiNGS. For real-time data interchanging between C64 (IDE64) and PC, IDE64 offers built-in USB 1.1 / USB 2.0 PC-Link system. Additional peripherals can be connected to IDE64 using the IDE64 proprietary ShortBUS or 'Amiga Clock Port'. DUART - industrial designed dual port RS-232 card and 10Mbit Ethernet card ETH64 (Contiki driver available), RR-Net and many more. More info on the IDE64 page.